A600 Series is designed to protect against power fault events typically found in telecom applications. This series is designed to be used in applications that need to meet the requirements of GR–1089-CORE and UL60950/EN60950/IEC60950. 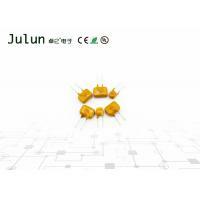 These resettable devices also help to meet the requirements of ITU K.20, K.21 and K.44. I hold = Hold Current. Maximum current device will not trip in 25°C still air. I trip = Trip Current. Minimum current at which the device will always trip in 25°C still air. V max = Maximum operating voltage device can withstand without damage at rated current (Imax). I max = Maximum fault current device can withstand without damage at rated voltage (V max). Pd = Power dissipation when device is in the tripped state in 25°C still air environment at rated voltage. 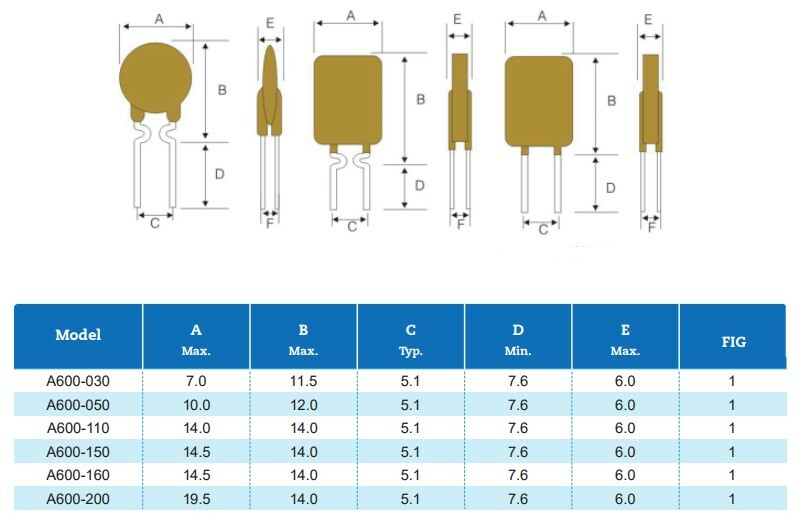 Ri min/max = Minimum/Maximum device resistance prior to tripping at 25°C. R1max = Maximum device resistance is measured one hour post reflow.